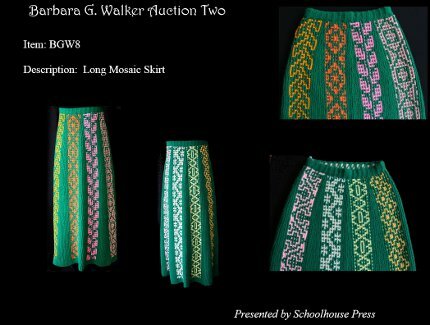 I meant to post about this the last round but I completely forgot about it, but Schoolhouse Press has been running a series of online auctions (the one happening now is the second of three) in which they are auctioning off original knits designed and hand-knit by Barbara Walker (of the Treasuries of Knitting Patterns fame, among other excellent books). Most of the garments were made for her book Knitting from the Top and use motifs from the treasuries. They’re beautiful just to look at, but it would also be amazing to own one of these bits of knitting history. They were knit by Barbara for herself, so most of the sweaters range from 30 to 40 chest circumference and the skirts are about 25 inches as the waist. But even if you couldn’t wear the garment, it would be great for a collector! I hope even if you don’t want to bid on them (starting bids are $50; the most spectacular pieces were already up to $200 plus with five days to go last time I checked) it’s certainly worth giving the look book (PDF) a look! I would love to have this skirt. It would be simply smashing with a coordinated blouse and jacket. I would be pleased and honored to add this lovely garment to my wardrobe. Thanx for the chance to win this collector’s item.